“We are one body…because we eat from one loaf of bread…and drink from one cup…” Not anymore. The practice of Holy Communion whereby Christians like to enact the ‘Last Supper’ said to have been rites performed by the founder of their religion – Jesus Christ, during the last meal he had with his disciples before he was crucified, is well known. In its original form, after serving bread (usually strips of Wafers) that represent the ‘body of Christ’ from a plate, a sip of wine symbolizing the ‘blood of Christ’ is taken from a special cup known as the Chalice. 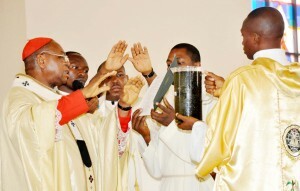 This is done in turn by members of the congregation, passing the cup from one member to the other or its movement facilitated by officiating Ministers of the Church. But with the knowledge of the transmission of Ebola Virus, where contact with body fluids including saliva is one of the routes; sharing of one cup for whatever reason including religious may no longer be tenable. Moreover, as responsibility for personal protection in this matter has been passed to each individual, people are bound to act in ways that would secure themselves. And so, if people have to associate even for religious reasons, alternative means of doing so have to be found that while satisfying such spiritual needs does not compromise the personal well-being of individuals. One church in particular, Christ Church, Port Harcourt is said to have done just that. An eye witness account of events of Sunday the 7th of September, 2014 noted that ‘plastic disposable cups’ were used to serve the ‘holy communion wine’ instead of the ubiquitous Chalice as it was the tradition. The source of this report narrated that prior to announcement of this modified mode of Holy Communion; there were a lot of apprehension among members with an assumed large number deciding not to partake in the ceremony. But with ‘personalized communion cups’, reassured members of the congregation were observed to have responded to fulfilling their spiritual obligations; as well as resulting to a successful Holy Communion service on this Sunday. A sample of commentaries following the exercise is believed to have suggested an indefinite continuation of this approach with respect to Holy Communion even after the Ebola virus disease has been contained. If this happens, then it marks the start of how a public health emergency can drastically change human behaviour on a massive scale. And this experience should provide some insight into how we manage public health matters in large societies such as Nigeria. This entry was posted in Public Health and Society by admin. Bookmark the permalink.